Over the last few years as more people got more comfortable with and more used to online communication, live chat has grown in popularity as a professional business tool. A recent Software Advice survey shows that over a half (56 percent) of respondents have used live chat at least once to ask a question on a company’s website while a little less than half (49% percent) prefer live chat for online-shopping questions to other communication tools. Many new websites try to install the live chat support software and utilize it. Some, however, leave disappointed. One of the most common feedback comments we receive from customers who decide to stop providing the service on their website is “our audience is not using the tool, the engagement is not sufficient to justify the expense”. In our opinion, one of the major reasons for under-utilization of live chat by customers lies in insufficient involvement of the company with the tool. As an engine needs ignition to get started, client-business communication also needs ignition. A lot of the times new users connect online with their live chat whenever they can, doing it in between other things, chatting with customers on the go, missing live chat requests or making customers wait. This leads to low quality service, customers’ mistrust that they can get a solution to their problem through this channel and in the end, decrease in engagement and abandonment of the tool. Live chat is a powerful instrument, which besides allowing simple customer-business interactions, gives many benefits and enables companies to build stronger connections with clients, improve their business image, grow the client base. However, if it is left unattended, if the ignition is not turned on by the company, it can remain a dead and useless tool. If your company is just starting out providing live chat support on your website and you feel that the tool is underutilized and not bringing the benefits you expected from it, there are a few guidelines on how to increase the efficiency of your live chat service. a) Customers are informed about your online availability. It means that when they click the chat button and see that the service is offline, they also see the online hours during which they can reach you. It is also important that your support team does not fail to appear online at the specified hours and does not leave the customers disappointed. b) Customers know where the chat button and links are placed on your website. Indeed, it is a widespread mistake for many websites, when they add the chat button only to one page of their website, or a few pages, and it is very hard to find the link, especially if the website has a complicated navigation structure with a lot of pages and menu options. Make sure that the chat button is accessible from any page of your site, is visible and attractive, and increased customer engagement is guaranteed. a) Reducing the wait times. Nobody likes to wait, especially customers who want to purchase online. If a client initiated a live chat request, they expect it to be picked up within 1 to 2 minutes at the most. According to statistics, 64% of consumers expect to wait 1 minute or less to speak to an agent via live chat. They expect the support agents to reply to their messages instantly, which means the agent cannot afford to type a response with one finger from their phone if good customer service is intended. b) Improving the soft skills of the support agents. According to Genesys consumer survey, 78% of customers say that competent customer service reps are most responsible for a happy customer experience. More than any other skills, clients expect the service agents to be friendly and polite. Following the right business etiquette in chat support and avoiding redundant, jargon, unprofessional phrases also helps to create a positive impression in the client’s mind. Hiring competent agents, providing good technical/product training for them is crucial for making customers want to come back and use the live chat channel again to solve their question. If a problem is complicated, the agents should show competence by escalating the issue to the right person, or investing their own effort into finding a solution and getting back to the client. Summing up the above, to increase the efficiency of your live chat, it is necessary to bring the channel to life, to make it active and vibrant, so that it fulfills its communication function and customers are not left alone with their problems. 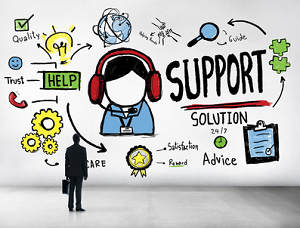 If each communication attempt of the customer receives accurate and timely response and feedback, the customer is bound to come back and use the service again and recommend using it to other people, which will increase engagement with your website and maximize the benefits from your investment into live chat support. We hope that your company is successful in implementing the live chat tool on your website and engaging customers. If you would like to share your experience using the tool, please feel free to do so in the comments. This entry was posted in Articles, Best Practice, Instructions, Tips and Tricks and tagged efficent live chat service, how to increase the efficiency of live chat, how to maximize the benefits of live support, live chat effectiveness, tips to improve engagement in live support. Bookmark the permalink.